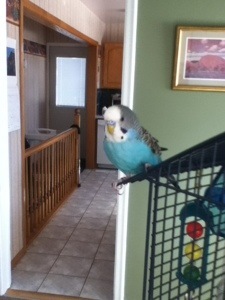 Opal, my mother’sk talkative budgie. Many thanks to everyone who has asked after my mother and myself, and especially to those who donated to my travel fund. THANK YOU. I can’t say it enough! My mother is, well, she’s not fine. But she’s not in a painful state of suffering either, thank god. She has this one week free of radiation and chemo before the chemo routine begins again. She nods off a lot. She has a lot of bruises. She feels frustrated and cranky pretty often. On Monday, I posted a Facebook update that I’d caught my mother mid-fall. This happened when she caught her foot at the edge of the ottoman and the cane didn’t give her enough stability to recover. The near-fall happened after a long day for my mother, so she was tired. But she was also fed up with my father for “hovering”. She wanted to be left alone for an hour or two, she’d be fine. I need alone time myself, I can relate. Before she nearly fell, it seemed like a reasonable idea. Well, Monday was an eye-opener. When she’s tired, she *thinks* she can do things, and she spazzes around like a sparrow trapped in a barn. She can’t be left alone without increasing the risk of a serious injury. She’s developed a personality quirk where Mom will do what Mom wants, when she wants, and the stress of illness just cranks up the intensity of her personality. So it’s not like we can settle her on the couch and leave for an hour. For the caregiver, my father, he’s not comfortable with the possibility of injury while he’s out of the house, even for 30 minutes. There’s something about my mother’s personality that motivates her to “do what she wants” the second she’s left alone. I can identify with that too. So, while I’m here, I’m giving my Dad a lot of breaks. I’m cooking a lot of meals, cleaning up, and doing some minor repairs to the bathroom grout. I drink coffee during the day and watch old movies with my mother, while she dozes. Yesterday, my aunt and I took her out to Walmart for 10 minutes, then we drove to the waterfront and looked at the iced-over lake, the passing dogs, the crows eating bait left by the ice fishermen, frozen into the ice months ago, thawing out now that spring is here. And it’s all okay. The most upsetting thing was the loss of dignity my mother has experienced and accepted. She’s still angry about it though. That’s okay, I can understand her resentment. Even though there’s not a lot to write home about, *being here* takes all of my focus. I’m fine and I’m grateful to be here. Tomorrow is my 35th birthday. I’ve made my birthday cake, and my sister will make a duplicate when I go visit her on Monday. She will be 29 tomorrow, my six-year younger twin. Tomorrow, I’m going to go to my aunts farm and visit the horses. Every day I do yoga, I walk to the Pembroke Mall (1hr round trip) and I watch old movies with my mom. It doesn’t seem like much, but it fills my whole heart.